Professional Bowlers Association champions Patrick Allen of South Salem, N.Y., and Mika Koivuniemi of Finland have been elected to the PBA Hall of Fame along with veteran bowling journalist Bob Johnson of Las Vegas and long-time Indianapolis tournament host Jim Doty, PBA CEO and Commissioner Tom Clark announced today. The 2019 PBA Hall of Fame induction ceremonies will be held on Saturday, Jan. 5, at the International Bowling Campus in Arlington, Texas, as part of the PBA Hall of Fame Classic tournament that will be contested at the International Research and Training Center Jan. 2-6. Featured photo from top left clockwise: Patrick Allen, Mika Koivuniemi, Jim Doty and Bob Johnson. The finals of the first tournament on the 2019 Go Bowling! PBA Tour season will be televised live on FS1 on Sunday, Jan. 6, at 11 a.m. EST. 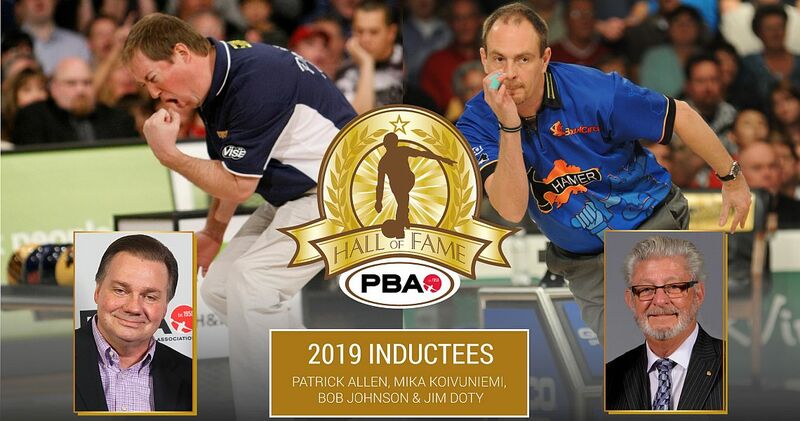 Allen, a 13-time PBA Tour title winner, and Koivuniemi, one of the most successful international players in PBA history, were elected by an elite panel of veteran bowling writers, industry leaders and PBA Hall of Famers in the Superior Performance category. Allen won PBA’s 2004-05 Chris Schenkel PBA Player of the Year after becoming the second player in PBA history to finish among the top five in all four PBA majors during the same season – finishing second in the USBC Masters and U.S. Open, fifth in the PBA Tournament of Champions and winning the PBA World Championship. “I don’t know exactly how I feel yet,” Allen said. “People are always saying you’re a lock (for hall of fame election), but you don’t know until it happens. I’m just happy I finally got there. I’m going to embrace it, and now I’ll have to figure out a speech. Koivuniemi, who now resides in the United Arab Emirates where he is coaching the UAE national bowling team, is a 14-time PBA Tour champion who earned his nickname – Major Mika – after winning two majors before he won his first “standard” PBA Tour title. In his first PBA television appearance, Koivuniemi defeated PBA star Pete Weber by a pin to win the 2000 USBC Masters. A year later he won the U.S. Open, and he claimed the crown jewel of his PBA career in 2011, when he won the $250,000 first prize in the $1 million PBA Tournament of Champions. “I’m having a really good day,” the 51-year-old Koivuniemi said. “It was a really great call (from Tom Clark). “I was 32 when I joined the PBA, but I had my experience around the world before I joined. But back then bowling on tour was something you needed to learn about. To bowl every week and to realize how good the players really were was different. Even when you had a good week, making the top 24 or a (TV) show was really hard. I knew I had to get better. Johnson, who began his journey into bowling journalism at age 15, is the only person in the bowling family to serve as editor of four national bowling magazines, winning 75 national writing awards for his news, feature and editorial compositions, many of which directly involved the PBA. Currently Senior Editor of Bowlers Journal International and editor of the BJI Cyber Report, he is a recipient of both the International Bowling Media Association’s Luby Hall of Fame Award and the Mid-America Bowling Writers Golden Quill Award. “I have been blessed to be able to cover bowling competition at the highest level, to see the best players bowl in the most pressure-packaged situations, and to be able to talk to them and write about them is a privilege I’ve never taken lightly,” Johnson said. Doty, who has served as general manager of Indianapolis’ Royal Pin Leisure Centers chain since 1996, has served as host for every major championship tournament conducted by the PBA at least once over the past two-plus decades. The 1971 Indiana University graduate joined the Royal Pin group in 1978, working under Royal Pin founder and 2018 PBA Hall of Fame inductee Don Mitchell as marketing manager until his promotion to general manager. “It’s a nice way to start your week,” said Doty of his congratulatory call from Clark. “It was a surprise. I wasn’t thinking about it, actually. I don’t think you do what you do with the hopes of someday being put into the hall of fame, but it’s always nice to be recognized for what you do. The 2019 PBA Hall of Fame ceremonies will be live streamed by PBA Xtra Frame on FloBowling. Tickets for the event will be available online in the future.